There and back. Out and In. However you put it, living on island means that travelling to the Mainland requires you taking a ferry or a plane. A bridge to Tiree would be a bridge too far. Thankfully this year Tiree has better connections by ferry and by plane. The island now has a dedicated ferry the MV Clansman and this in itself has increased capacity. Additionally in the peak summer months there will be two crossings on a Saturday. The island desperately needed this improved ferry capacity, as in the summer months the sailings were often fully booked. Likewise, we now have a 7 day a week plane service throughout the year with two planes each way 6 days a week. For those in a hurry the plane normally has you in Glasgow in under an hour. The Twin Otter plane which covers most flights carries a maximum of 14 people and is noisy, but on a clear day it affords magnificent views of the Clyde, Argyll, Jura, Colonsay, the Ross of Mull, Iona and the Treshnish Isles.Theoretically you should be able to catch the morning flight to Glasgow and return in the late afternoon flight, but due to delays and cancellations this is not a reliable option. The ferry service is a must for those who require to take their own car, van or lorry. For those who are not bound by a time constraint, the journey is more leisurely. The fastest crossing is about 3 hours 20 minutes, otherwise the sail to Oban is 3 hours 40 minutes, wind and wave permitting. On a clear day nothing beats the ferry for the stunning views of Oban Bay, Lismore, the Sound of Mull, Mull itself with colourful Tobermory, the Small Islands, Coll and the Treshnish Isles. Many carry binoculars and have cameras on the ready as there is the possibility of spotting dolphins, porpoise and basking sharks to mention just some of the wild life. Recently we had an appointment with the Baptist Union of Scotland (a fellowship of Scottish Baptist churches) in Glasgow. The Tiree Home Coming A’ Bhuain put time constraints on our travel arrangements. There was no option but to travel out on the Sunday flight and return on the Tuesday morning flight. The weather out to Glasgow was warm, sunny and calm. Our stay in the city was like the best of summer days. When we left Glasgow International Airport and for almost the entire journey the views were enhanced by clear skies. It was only as we flew over the Passage of Tiree we saw a blanket of cloud (mist) covering the island. Thankfully the pilot found a window that enabled the plane to land safely. However, you travel, the service provided by those working at both Tiree Airport and the Pier is excellent. It is personal, friendly and helpful. Rib in Gott Bay, the mist having cleared. 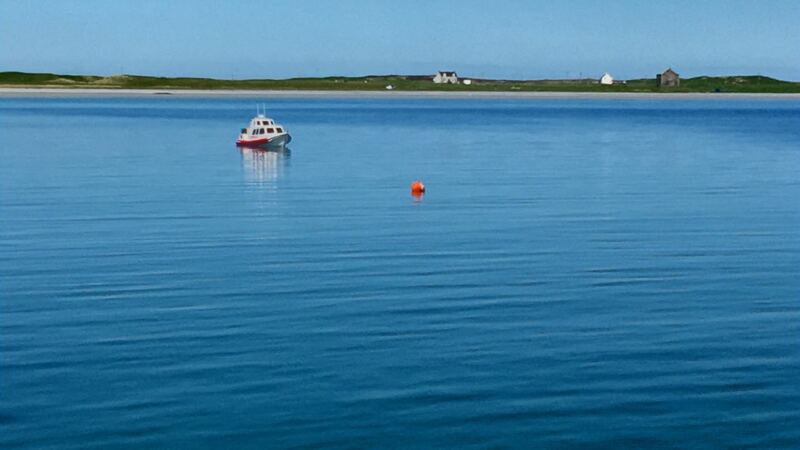 This is ‘Life on Tiree’, there and back.